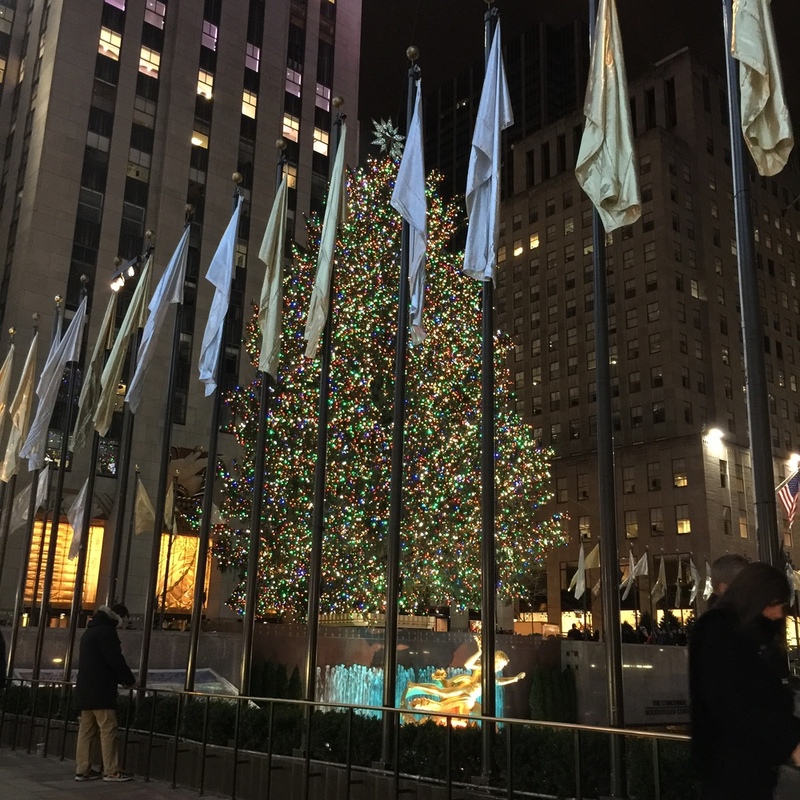 NYC - fashion, fabric, and Christmas! I hopped a plane to New York City and met two old roommates from BYU to reconnect and recharge our spirits and creative juices. And that we did! One of the highlights of our trip is something that I knew my readers would like to hear about... a tour of the NYC fashion district. Our tour guide was Rebecca of Seek New York LLC, and she was amazing! When not giving tours, she works in television and theatre doing costumes and design, so she seemed to know everything. Here we are in front of FIT (the Fashion Institute of Technology) where the tour began. I got to wear one of my Knit Infinity Scarves that I made from the pattern in Just For You and I took my Two Zip Hipster bag that I made with a DUMD pattern. I love wearing things that I've made! Our tour took us all over the fashion district where Rebecca recounted the history of clothing in New York and where it was designed, made and sold. She showed us how buildings used to look and then we saw how they are now. It was fascinating. We got to see some famous Project Runway landmarks like the (old) Parson's building (it has been sold) and those revolving doors at the Atlas Hotel where the contestants go in and out. We did the fashion walk of fame and admired some gorgeous sketches. and our tour sadly but very happily ended at Mood fabrics. Sadly of course because we had to say goodbye to Rebecca and the rest of the tour but happily because of all the yummy fabrics! Leaving Mood I was totally inspired by this vintage chic button and bead Christmas Tree collage. If I wasn't going home to frantically shop for and sew last minute gifts and get every thing wrapped, sent, and given away, I might try this. But I think it will have to wait until next year. If you're visiting NYC anytime soon or trying to find a gift for your favorite fabric junkie I totally recommend Seek NYC Tours. I think I'll try a different one the next time I'm there. It was so much fun. For a limited time you can use coupon code 'SEWCAN' to get 10% off the cost of any tour or tour gift certificate. Thanks Rebecca! And of course I saw plenty of Christmas. From the tree at Times Square to the windows and decorations at Macy's to the zillions of Santas (SantaCon was in full swing) I loved every minute. The 35 degree weather made it seem perfect. Merry Christmas everyone... hope you love every minute of your holiday.